Grateful thanks to Crawfords for getting me out of a fix when the search head bolt sheared on my Tes..
My wife and I have been detecting for about 3 years with various amateur machines. After deciding to.. The CS1MX is one of our best selling budget metal detectors for a good reason; Put simply, the C.Scope CS1MX is a great metal detector. It is light, well balanced and it looks terrific. 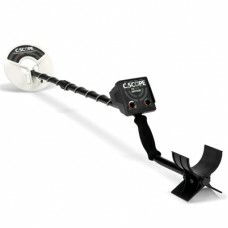 Add to this its performance capabilities and you have probably the best metal detector in its class. Because the operating frequency is 17Khz (17 -19KHz is the frequency range favoured by experts for sensitivity) the CS1MX is very sensitive to small targets such as small hammered silver coins. Simplicity is built in, Just set the two controls, sensitivity to control the depth and discrimination to reject unwanted trash items and thats it, off you go. "Do not be fooled by the price. The CS1M is a serious detector designed to be simple enough for the novice to get to grips with straight away yet with enough performance to satisfy any enthusiast. 10/10"
Fully automatic tuning. 1/8" headphone socket.